Message From President of EcoKnights, Yasmin Rasyid. The month of February was such a fun yet hectic period for us. EcoKnights launched the 10th edition of our school environmental program and competition, Anugerah Hijau (Green Awards) in which the theme this year is to focus on reducing a school's impact on river systems. We are anxious to see and hear from our young aspiring Malaysians on their ideas on how their schools can be better river guardians of the country. Do head over to the Anugerah Hijau website to find out more and if you're keen to support this as part of your CSR, we are always keen to explore. In that same week as the Anugerah Hijau launch, we also organized a symposium called "Sustainable Mining Development and Practices in Malaysia" as part of our collaboration with University Malaya, Waseda University, and Universiti Teknologi Malaysia under the support of the W-Bridge. We had a full house of participants and a range of speakers from the mining industry, academia and NGO sector. You can click here to view the pictures. In this symposium, EcoKnights presented a paper on their findings on the perception of Malaysians on the mining sector. You can view the key findings and results here. Our next steps would be to provide more outreach to the public on mining development in the country through our established relationship with certain mining industry leaders. So do stay tune to this space for updates on our extension work on sustainable mining development in the country. Meanwhile, as we move on to March, I'd like to share with you that our efforts to support and promote Sustainable Development Goals 12 - Sustainable Consumption and Production, is moving ahead with the revival of our annual Green Market platform. Featuring close to 60 businesses and NGOs that are promoting SDG 12, they will be showcasing their products and services at Publika from 24th March until 1st April 2018. 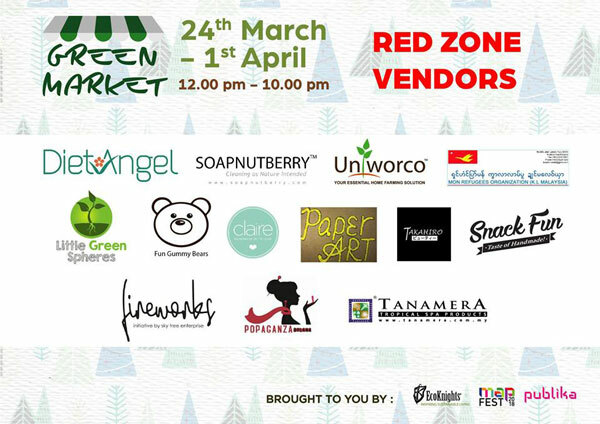 Head to the FB event to find out more on the participants of the Green Market, and it helps you plan your responsible shopping experience as well. Here's wishing you a great end to March and a wonderful start to April. Subscribe to our social media platforms today if you haven't so and be updated on our small local efforts, and we hope you will join us by plugging in to our outreach efforts. On 24 February 2018, EcoKnights educated more people through a large and interactive river-themed ‘snake and ladder’ game Survival Charity Run that was held at the Perdana Botanical Garden, organized by Methodist College Kuala Lumpur (MCKL). Read more on the participation. EcoKnights provides internship programmes for students or graduates interested to learn and train themselves in community engagement and the environmental field. The interns are trained to develop themselves in various skills such as project management, communication, social research/study and writing, to name a few. 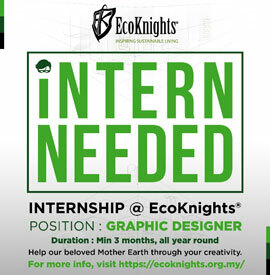 EcoKnights is currently offering spaces for graphic design interns. Please send your resume (including a cover letter) to us at interns@ecoknights.org.my. Have a read of our past graphic intern, Luqman, as he tells his journey of creatives in EcoKnights. Continuing EcoKnights’ partnership with AVEDA Malaysia in its third year, the first phase of Project H2O Air Kuning was launched on 24th February 2018. This project is under the collaboration between EcoKnights, Aveda and Build For Tomorrow. Phase One of the project achieved its target to supply the Temuan community of Kampung Orang Asal Air Kuning a source of water for the time being whereas the implementation of a filtration system will take place during Phase Two of the project, which will be held in April 2018. Read more on what the volunteers did for this project with a good cause. 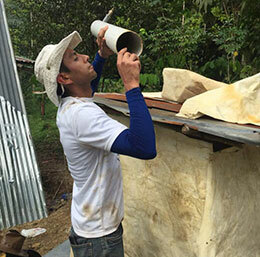 Check out how you can help Project H2O in conjunction with AVEDA Earth Month 2018. 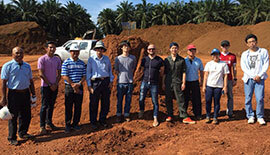 From 1st March until 3rd March, EcoKnights together with Waseda University embarked on a 3-day journey consisting of mining-related projects under the Waseda-Bridgestone Initiative – The Symposium on Sustainable Mining Development and Practices; W-Bridge Initiative Tree-Planting and a knowledge-sharing visit with Spring Energy Sdn Bhd. Click here to read more on the second project by EcoKnights and Waseda University. 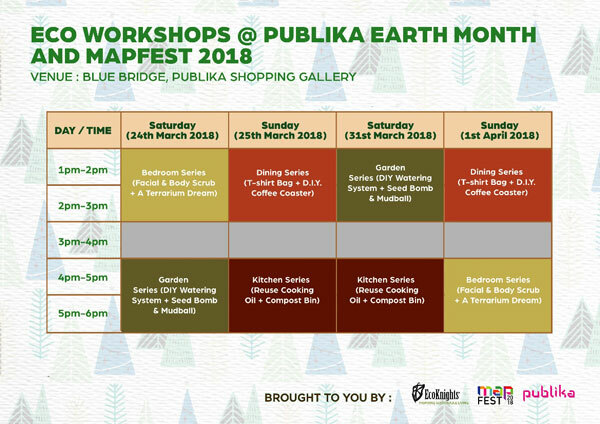 In collaboration with Publika, EcoKnights will be organizing the signature Green Market, community workshops and performance in conjunction with Earth Month and MAPFEST 2018 to promote public awareness towards environmental and sustainability living. 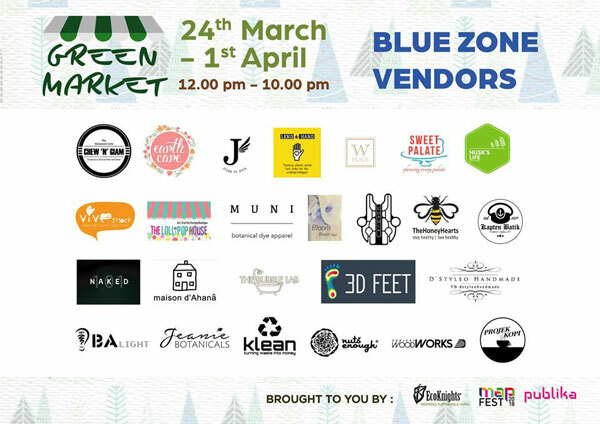 Come and support our 43 local vendors championing eco-friendly products and services at the Red Zone and Blue Zone of Publika, ranging from beauty products, green technology to food and beverage. If you are looking for fun workshops on sustainable living, you can refer to the schedule below and register here. We will be offering workshops on sustainable living practices like composting, permaculture eco-enzymes and more! Stay tune in the event page for more updates prior to the event. 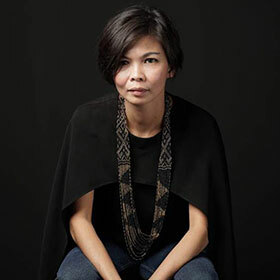 On its third year partnership, AVEDA Malaysia will be working together with EcoKnights to educate and empower the general public on issues related to water accessibility, pollution and water availability through Project H2O. Join us in spreading awareness towards taking environmental responsibility to treasure water. This year’s campaign will focus on raising funds through various activities in the period of the 16th to 22nd April 2018. Amongst the activities that the public can join to support this cause are the Charity Cut-A-Thon (20th April 2018) and the Charity Yoga4Water (22nd April 2018) session. To know more about this campaign and how you can participate, read more here or contact Zafran at 03-77318361 or zafran@ecoknights.org.my. For registration, you can click here. The Zero Kitchen Waste Series will be continuing with its third workshop on converting used cooking oil into soaps on 14th April from 10am – 11.30am. You can refer to the calendar on the poster to find out the workshop available on each month. 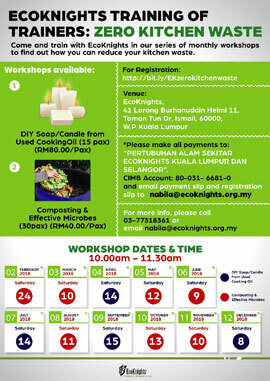 Registration starts on 23rd March, for more information, please contact Nabila at 03-77318361 or nabila@ecoknights.org.my. On 27 February 2018, the 10th edition of Anugerah Hijau was successfully launched at Taman Dusun Bandar (Urban Orchard Park) Hall Kuala Lumpur by the Assistant Director of the Department of Irrigation and Drainage, Mr. Mohd Asmadi Bin Haji Awang Senik. 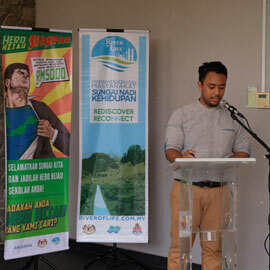 The launch was witnessed by EcoKnights, partners as well as 35 school representatives that are located nearby the basin of Kerayong River and Klang River. Read more on the event here. To know more Anugerah Hijau and how secondary schools in Klang Valley can participate as a zero trash school, you can contact our officer Mr Emirul at 03-77318361 or emirul@ecoknights.org.my. 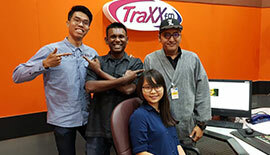 Tune in to Traxx.fm’s interview with EcoKnights president Yasmin Rasyid to find out how EcoKnights is inspiring youths to be river guardians. 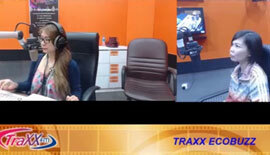 Tune in to Traxx.fm’s interview with EcoKnights Programme Director Fadly Bakhtiar and Project Woodwork’s Wallace as they spoke about SDG12 – Responsible Consumption and Production, and how they are playing their part in it. 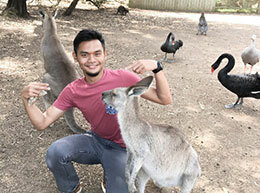 Find out what our previous interns, Rizan Faiz has to say about his experience in our internship programme.